You can partition a table into chunks, and then choose which chunks you want to process (for example, you could choose to load just transactions for the year 2015, knowing that data for all previous years is already in your model and won't change). 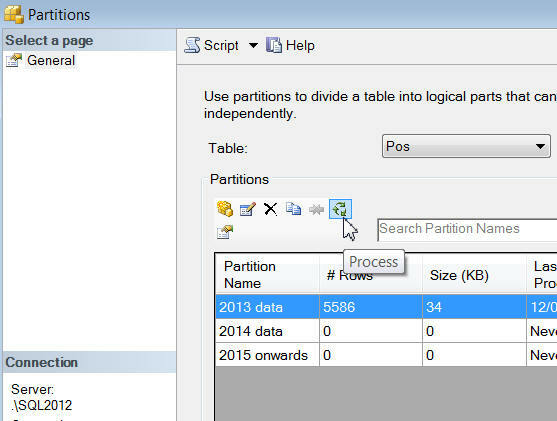 Beware: for versions of SQL Server earlier than 2016, partitions on different tables are processed in parallel but partitions on the same table are processed in series. This means that if you have one table which is much bigger than all of the others, partitioning it won't significantly speed up processing time if you need to upload all of its data. It's unlikely that data from earlier years will change, so you could put this in one or more separate partitions. 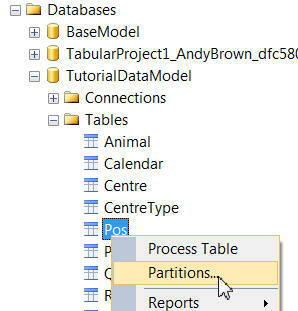 When more point-of-sales records are created, you should now just be able to do a Process Data on the 2015+ partition followed by a Process Recalc on the database. As this diagram shows, you can't include calculated columns in partitions (these are processed in the Process Recalc stage, not the Process Data one). 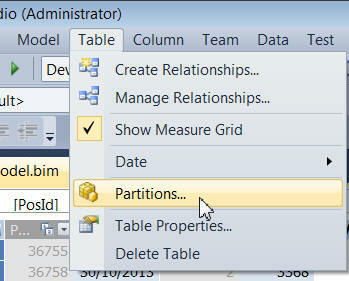 Select the table you want to partition in data or diagram view. 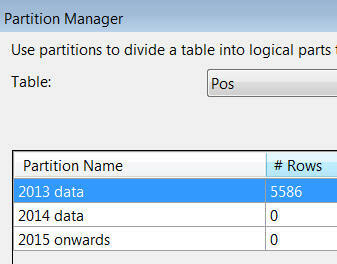 Choose this menu to see this table's partitions. 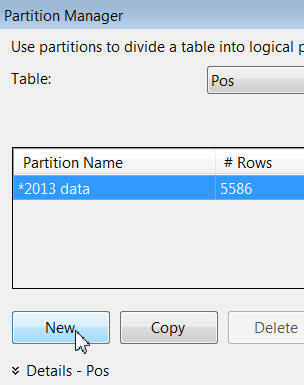 Change the name of the partition from tblPos to (say) 2013 data. I can't find any way of doing this apart from by using a custom filter. Here I'm including all point-of-sale rows for the year 2013. 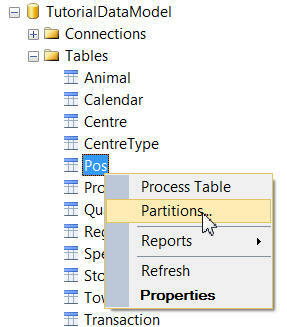 Click to create a second and subsequent partition. Don't worry about the fact that all of the rows are in the 2013 data partition for now; this will change when you reprocess your model. Note that it is entirely up to you to make sure that your partitions neither overlap nor miss out vital data. Tabular SSAS won't tell you if processing would create anomalies. 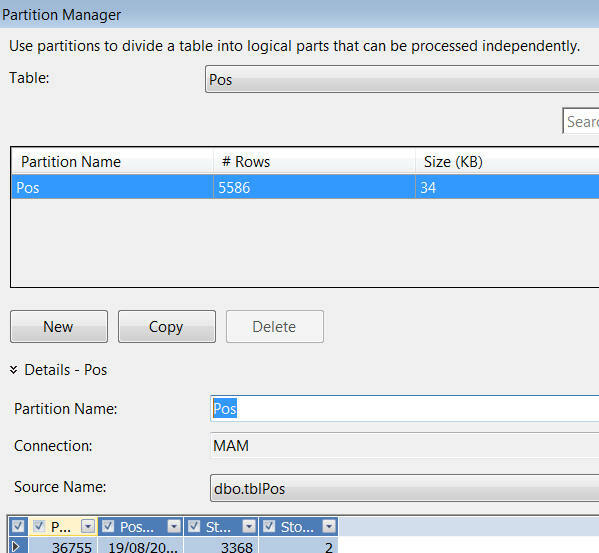 First select a table, then choose this menu to process its partitions. 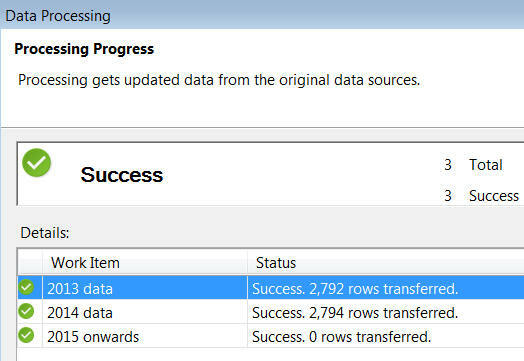 You'll need to use Process Full the first time, to get rid of any old data and hence avoid creating duplicate values for the PosId column (see my blog on Processing for more details about what each processing options entails). 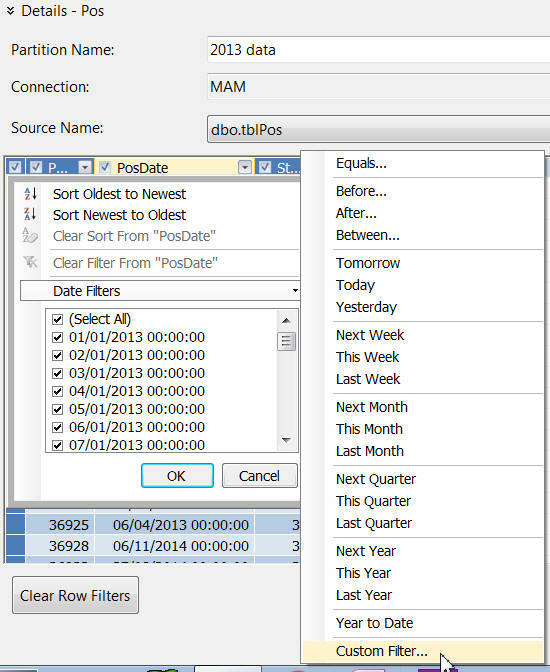 There are no rows in the MAM database for any year after 2014. You can add a new partition by clicking on this icon. No fluffy GUI tools here! 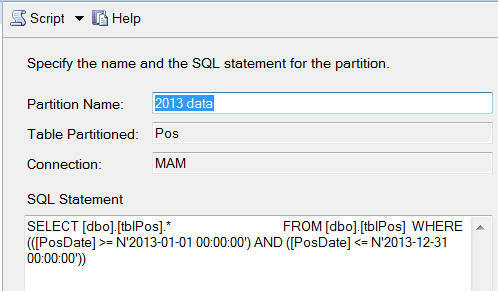 This SQL query would give you the data for the 2013 data partition, for example. 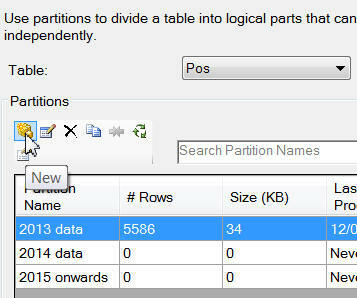 First right-click on the table some or all of whose partitions you want to process. Click on this tiny icon to process one or more partitions. 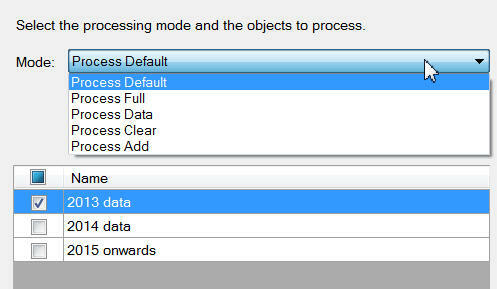 Select a processing method, and tick the partitions you want to process. Once again, it's reassuring that the two sets really do partition (in the mathematical sense) the table of point-of-sales data.